This article is about the mountain on the border of Bolivia and Chile. For other uses, see Kunturiri. Kunturiri (Aymara kunturi condor, -ri a suffix, Hispanicized spelling Condoriri) is a volcano in the Andes on the border of Bolivia and Chile which rises up to 5,762 metres (18,904 ft). On the Chilean side it is located in the Arica and Parinacota Region and on the Bolivian side in the Oruro Department, Sajama Province, Curahuara de Carangas Municipality, Sajama Canton as well as in the La Paz Department, Pacajes Province, Calacoto Municipality, Ulloma Canton. Northeast of it in Bolivian territory lies Jach'a Kunturiri, due east lies Nevado Pumuta, due south Patilla Pata and northwest lies Laram Q'awa. The mountain is covered by ice along with some of the surrounding mountains and is the source of a number of rivers that flow down its slopes. Kunturiri is part of a complex of volcanoes along the frontier between Bolivia and Chile, which have developed atop older ignimbrites of unknown thickness. Three separate stratovolcanoes generated through both effusive eruptions and explosive eruptions make up the Kunturiri complex. It is formed by rocks ranging from rhyodacite to rhyolite and which contain phenocrysts of biotite, plagioclase and pyroxene. 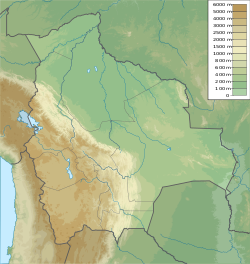 The Kunturiri volcanic complex 3-2.2 million years ago was the origin of the large Lauca-Perez Ignimbrite, which covered about 15,000–20,000 square kilometres (5,800–7,700 sq mi) of land with over 775 cubic kilometres (186 cu mi) and reached as far as the Pacific Ocean, leaving a distinctive landscape on the Altiplano. The eruption left a caldera now presumably buried underneath the Kunturiri volcanic complex. While the volcanic complex was once considered to be 7-9 million years old, later efforts have found younger ages and argon-argon dating has yielded ages of 650,000 ± 70,000 years ago for rocks erupted from the Kunturiri volcanic complex; there is no fumarolic activity at Kunturiri, but Kakepe has hydrothermal activity. Other volcanoes in the area are Pomerape and Parinacota which are constructed on the so-called Condoriri lineament together with Kunturiri; this lineament may act as a magma pathway to the three volcanoes. ^ Clavero, J.E. ; Sparks, R.S.J. ; Polanco, E. 2012. Geología del Volcán Parinacota, Región de Arica y Parinacota (versión corregida). Servicio Nacional de Geología y Minería, Carta Geológica de Chile, Serie Geología Básica 132: 31 p.11, 1 mapa escala 1:50.000. 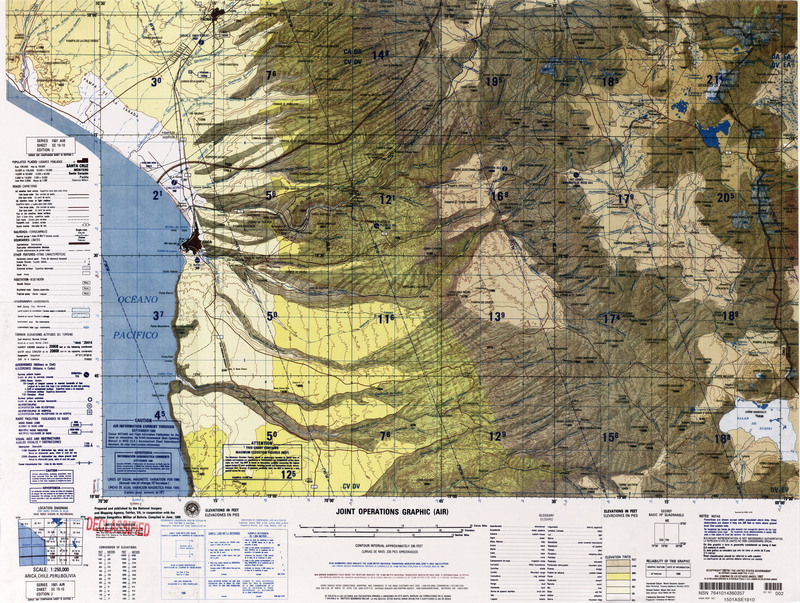 ^ a b Defense Mapping Agency (1995). "Arica, Chile; Peru; Bolivia" (Map). Latin America, Joint Operations Graphic (2 ed.). 1:250000. ^ a b c d Scandiffio, G.; Rodriguez, J. (1990). "Geochemical report on the Sajama geothermal area, Bolivia" (PDF). IAEA. Retrieved 11 November 2018. ^ a b Vargas-Mattos, Gabriela; Geraldes, Mauro Cesar; Salinas, Ramiro Matos (25 August 2016). "RECONSTRUCCIÓN GEOLÓGICA DEL VOLCÁN CHULLCANI (MIOCENO SUPERIOR A PLIOCENO SUPERIOR): CONSIDERACIONES GENERALES SOBRE GEOQUÍMICA Y EDAD DE LAS FASES VOLCÁNICAS, ANDES CENTRALES DE BOLIVIA". Revista Brasileira de Geociências (in Spanish). 36 (4): 714. ISSN 0375-7536. ^ Schroder, Wolfgang; Wörner, Gerhard (1996). "Widespread Cenozoic ignimbrites in N-Chile, W-Bolivia and S-Peru (17°-200S/710-680E): Stratigraphy, extension, correlation and origin". ResearchGate. ^ R, Clavero; E, Jorge; Sparks, Stephen J.; Polanco, Edmundo; Pringle, Malcolm S. (December 2004). "Evolution of Parinacota volcano, Central Andes, Northern Chile". Revista geológica de Chile. 31 (2): 317–347. doi:10.4067/S0716-02082004000200009. ISSN 0716-0208. ^ Hora, J. M.; Singer, B. S.; Worner, G. (1 March 2007). "Volcano evolution and eruptive flux on the thick crust of the Andean Central Volcanic Zone: 40Ar/39Ar constraints from Volcan Parinacota, Chile". Geological Society of America Bulletin. 119 (3–4): 360. doi:10.1130/B25954.1. ISSN 0016-7606 – via ResearchGate. This page was last edited on 17 November 2018, at 10:28 (UTC).